The oils in our Artisanal White Sulfate Free Melt & Pour Glycerin Soap Base give it a great glide and soothing feel, making it great for shaving. It is non irritating and mild enough for anyone to use. This Artisanal Sulfate Free Melt & Pour Glycerin Soap Base uses a synergistic blend of moisturizing oils. The oils in the soap give it a great glide and soothing feel, making this soap great for shaving. It is non irritating and mild enough for anyone to use. Ingredients, such as oatmeal, can be added to create a soothing facial soap with mild exfoliant properties. Please be aware that SLS free soaps do not contain surfactants and may not lather as well as regular soaps. May be combined with most Essential and Fragrance Oils, as well as colors and pigments. 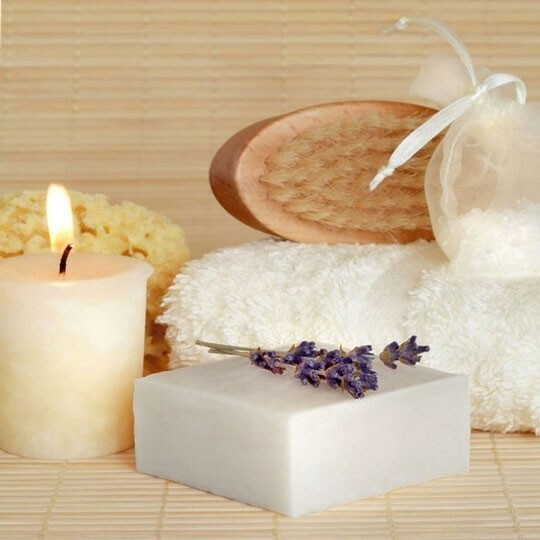 It is an excellent base for Aromatherapy soaps and other mood enhancing products. Our Melt and Pour Glycerin Soap Bases is easy to use. The bases can be melted using a double boiler. A microwave will also work if melted with caution in small time increments. Once melted, colorants, fragrance, essential oils, and other additives can be added to the soap. Pour into a mold, silicone molds work great, and allow to cool. Once thoroughly cooled, unmold loaf and slice into individual soaps. So Simple! Quality is Our Top Priority. Our QC team is dedicated to the complete review and inspection of both raw materials and finished products to ensure premium quality. We only deliver the best quality product possible, as you, our customer should expect from us. Our lead chemists have over 75 years of combined experience in the research and development of soap, personal care item, and custom cosmetic product line manufacturing. Your questions will never go unanswered at Essentials By Catalina. Proudly manufactured at our facility in Corona, California. Our state-of-the-art equipment, 20,000 square foot facility, and experienced team is capable of producing 200,000 pounds of soap product per week. 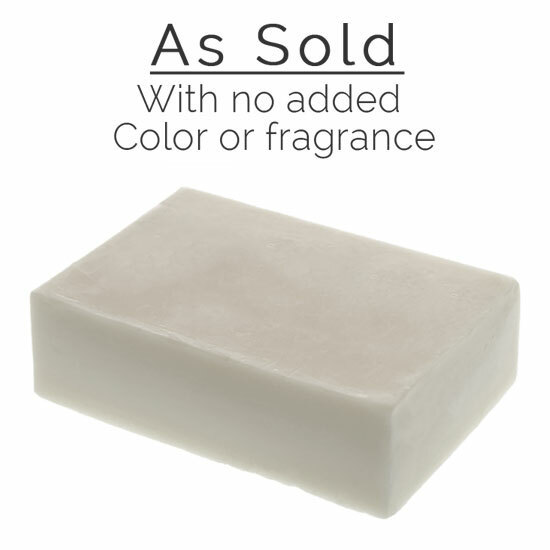 Our Artisanal White Sulfate Free Melt & Pour Glycerin Soap Base is amazing as is but it can also be fully customized by adding one of our Great Scents, Additives or Extracts. Fragrance Load: Up to 1% for most applications. Please see mixing instructions tab for more info. Directions for use: Use same as you would any soap. Please Note: This Soap uses only all natural ingredients, there will be variations in clarity and shade of whiteness from batch to batch. These variations are normal and do not affect quality or performance. Before melting, cut your soap from top to bottom to better distribute any ingredients, like titanium dioxide, which may have settled at the bottom. Once the soap is in liquid form, add your Fragrance or Essentials Oils. Usually no more than one (1) tsp per Lb of Soap Base is all you need. Do not add scent until the soap has cooled below the fragrance's flash point. Other additives may be incorporated at this stage. Pour into your mold and let rest until solid, silicone molds work best for most applications, wood block molds are great for bulk quantities. Once soap has fully cooled, un-mold and wrap, your soaps are now ready!. Sorbitol, or glucitol as it is sometimes called, is a slow-metabolizing sugar alcohol derived from fruits, corn and seaweed. It has moisturizing qualities and can be used in lotions, moisturizing soaps, and other personal care products. Sodium cocoate is the sodium salt of fatty acids from coconut oil, lauric acid is the primary component of this oil. It functions as a surfactant. Sodium stearate is a sodium salt of stearic acid. it is a naturally occurring fatty acid, it can also found in natural ingredients such as shea butter. It is a fine, white powder. soybean is used as a skin conditioning agent, surfactant, and a viscosity increasing agent. It is a powder that is white that is often used as a colorant. It is used in makeup and personal care products. As close to hot or cold process as you can get. This soap is amazing. I can even get a swirl on top if I let it cool before pouring in the mold.